That’s how it felt once it was over. I was eagerly anticipating the morning as I went to bed after adding velcro to couple doggie socks. Since the 21st had been so warm, I wanted to get an early start to spare Loke and I both the potential heat of today. Irritatingly I slept later than I’d hoped to, waking around 4:45 am. It had gotten nippy during the night with a low around 47 F and hovering around 48 as I dressed. It was a wonderful surprise after the heavily oppressive warmth of the day before. During the entire drive, Loke had been antsy. He barely laid down, staring out the side window when he wasn’t watching out the front with his head resting heavily on my shoulder. Even after Jens braved the mosquito swarms to walk him for an hour, he pestered us all evening. Since we’ve done trips like this before, I guess he knew something more was going to happen and he didn’t want to wait. It must have kept him up late because it took food bribery to coax him out of the bedroom where Jens still slept. Once he realized I was in the magic clothes, he started to get excited. Things had been moved around in the car to leave the trike free so I could get it out on my own. Around 5:30 am I clipped in, loaded up with a bit of food, maps, the dog and 2 extra liters of water to go with the 3 liter platypus bladder. Loke took off like a shot upon hearing the click of the brakes releasing. For him, that sound at the first of a ride is like the starting pistol to a bunch of sprinters. A small road ran parallel to the main one and immediately from our cabin it had a lovely down slope that let the furry one hit 19 mph. His breath puffed in clouds around the goofy flapping tongue of the husky grin. I let him have his run in that chill morning air. Though it was technically paved, the little remained of the bitumen in between the rocks of what had once been asphalt. It made for a very rough, nobbly surface identical to the road north of Storblåsjon that left Loke hobbling with bad stone bruises in less than 11 miles. Stone bruises he managed to hide until just before Jens picked us up to go eat, I might add. Sneaky furball. To prevent a replay of that disaster which would ruin his runs on Saturday and Sunday, socks were the only option. So, around mile 1.5, I stopped to wrestle them on. Much as I would have loved to make the cat happy, I reached out to grab Loke’s harness as he watched the purring shape approach. Thankfully, he spotted Loke, stopped and quickly retreated back across the yard. I felt a little sad. I love cats, but missing out on random kitty cuddles is the price I pay for my furry cycling buddy. Cat hidden and safe from Loke’s predatory instincts, I went back to my task while battling a cloud of mosquitoes. Socks wrestled on and tape reinforced soles, we set out again. I kept an on-again-off-again watch on Loke’s feet, resolved that if he lost one, I’d have to turn back for it. Not knowing how long the socks can last and with 4 husky feet and only having 6 finished socks, each one could be important. Wouldn’t you know it. 1/2 a mile later, I turned around to search for a silver, white and blue crumpled shape that would be a home-made doggie sock. We rattled along that small back road for completely peaceful, traffic free miles. When the trees permitted, I caught glimpses of the river with the morning sun shimmering on its current churned waters far below us. The cool air was still except for the trill of bird song around us. Only once was there even a hint of a car and that was only the sound of its tires on the larger road well hidden by a wall of trees. At last, I was forced onto the larger 62. Perhaps it was even fortuitous. Nature was demanding I answer her call and wouldn’t you know it? Less than quarter mile after turning onto the bigger road, an outhouse. A parking bay like the dozens of others we’d passed on the drive up, but this one had the small outhouse and a picnic table. I opened the door and had a feeling Murphy (as in Murphy’s Law) was laughing at me. Just over the door and on the door itself dangled wasp nests. I froze with images of dozens of wasps streaming out in defensive fury. I think Murphy still had a laugh at me. The kind someone gives when they’ve thrown a plastic snake at a friend. The nests were empty. Still gave me quite a scare before realizing that. Loke and I continued our ride, climbing and coasting over the miles. Considering the tall hills (or very small mountains) flanking us on the left and the sharp drop to the river on the right, I was quite surprised at how gentle and short the slopes were. And Loke? He ran like a finely tuned machine. He wanted to race down every slope at 15-17 mph. On the more level stretches, he still maintained a brisk trot of not less than 8.5 mph. The only time our speed dipped lower than that was when the climbs became steeper than a 3% and I couldn’t spin fast enough to hold the pace. When we did slow, he threw his weight into the harness to keep us going as fast as possible. Even by mile 8, his stamina held strong. We did hit a trip best of a little over 20 mph when we came across a hare sitting in the middle of the road. It didn’t even need to move before Loke poured on the speed. It ran down the road for 50 meters or so before cutting back into the woods. It seemed in no time we crossed the bridge over the river to start our southward leg along its other side. As we made the made the turn south, I smiled to see a brown and white sign for ‘Brattfället’ (The Bratt Falls) 5 km away (roughly 3 miles). My smile was brief. Immediately after the turn, came ‘The Climb’. The road tilted upward into a slope varying between 7% and 10%. While the morning had started off chill and still couldn’t be called warm, the sun was hot and the direction of the road left not a scrap of shade for meters to either side. The torment seemed unending. No fun downhill to coast along after 1/8th or a quarter mile (or less). After more than a half mile of struggle and no end in sight, it was time for the thin wool top to go. I locked my brakes, now good enough to hold even on a 10% grade, to remove helmet, hat and sunglasses. Free of the black wool, I took a moment to savor the feeling of coolness. From the corner of my eye, I saw the silhouette of a cross near head level. Baffled, I put back on my sunglasses to ease the sun’s glare. Less than 50 yards away, nearly hidden in the shadows of the trees covering the steep slope, was a church. 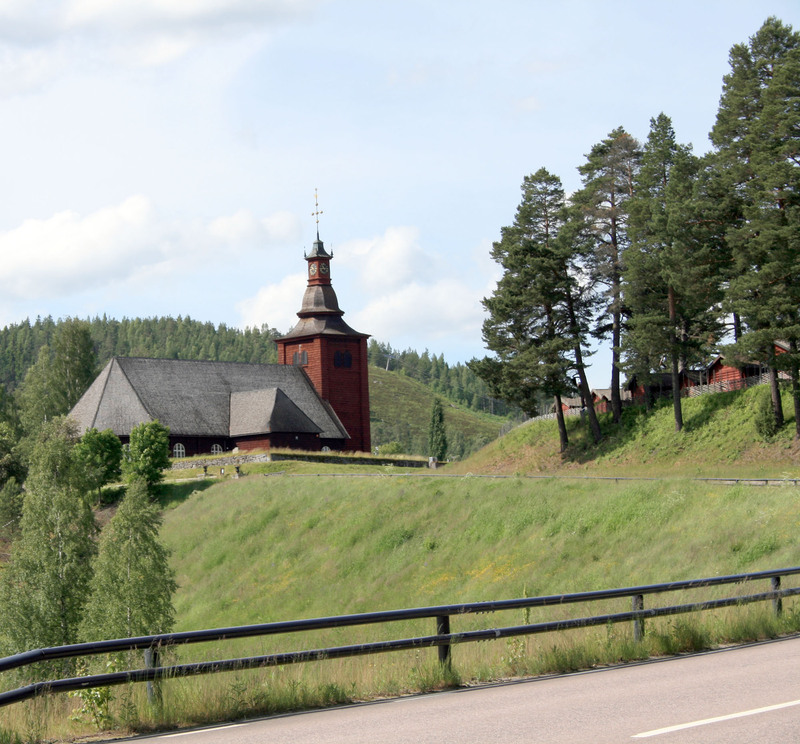 Not an old one as Swedish country churches go, but I’d guess a century or two at least, with what might have been a copper roofed steeple. More than that I couldn’t really see in the deep shade. It was unexpected. Really, who expects to look to one side and find the cross of a church steeple at eye level while riding a country road? Not to mention there’d been no trace of the church even with a clear view across the river. It was that well hidden back in the trees. To think I never would have seen it if not for stopping to shed a layer of wool. Curious, I looked back wondering where the turn to the church was. That quick look killed my inquisitiveness. While the coast down that half mile might be fun, a photo of what might be a disappointing church couldn’t make me climb that stretch again. It would have taken something a little more tangible to convince me to do it. A huge bundle of cash, saving a life, that sort of thing. Only a masochist would do it for free and that I am not. Still it was back to the torture. I’d say that agonizing climb lasted more than a mile, maybe as much as a mile and a half. At least, that’s when the slope became less than 7%. By then, Loke didn’t seem to object to our more modest speeds of 6 − 7 mph, mostly because he was hot. I offered him water frequently, wet down his ears. The upward grades far exceeded the down, but at least additional stretches of 7% or greater were small and few. Mostly it was 3% – 4%. With more of that rough asphalt adding to the roll resistance, it still made for hard work. At least we had shade for most of it. It seemed forever before I came to the turn for Bratt Falls. There wasn’t much of a parking lot for the paved path that led off to the rails of a wooden bridge I could just make out. Big concrete barriers were set too close for me to get the trike through even without Loke and the running bar. It was a short enough walk from the barricades to the bridge though. I think the term ‘Falls’ was a bit too generous a term for the stretch of water. Frothing white rapids for 200 − 300 yards being squeezed into a natural rock channel for part of it, yes. Still pretty enough to admire and take pictures of, certainly. Not my first choice for the definition of a water fall. After Bratt Falls the fruits of our laborious climb were harvested, though I can’t say if it was 1 mile or 3 miles after we left that parking lot. One moment we were plodding at 6 mph and the next, 12 mph with Loke grinning happily as he loped along. I stopped to add a few more layers of tape to protect him from the terrible road before letting him run as he liked as long as I could maintain the speed. He might have gone faster, but by that point we’d covered 12+ miles and it was another 10 or so to Eksharad where I planned to stop. I didn’t want him to exhaust himself with an extended 15 mph (or faster) charge. We zipped down what I hoped was the last big slope of the ride toward a village below. As we went by at 14 mph, a woman sitting in her yard, enjoying the day, called out a greeting as we passed. Somewhere along that flying charge, the Garmin ticked over 19 miles! The ride had officially become the longest of the year and still more to go! The last few miles toward Eksharad were nearly flat. Jens called when only two more miles lay between us and the town. He was about 10 miles away and would meet me at the church. Just across the bridge leading up to the beautiful red church was a sign for a burial ground pointing down a dirt road that followed the west riverbank to the south. I knew the roads Jens would be traveling could take time so I decided to take a peek. The road wasn’t too bad, but after about a half mile with no sign of the burial ground, I turned back. It wouldn’t have been fair to keep Jens waiting because of a random side trip begun after I already knew he was on his way. I felt guilty enough about my cycling potentially interfering with his fishing without adding to it. He fishes so rarely as it is. Just as I was slowly cranking my way up one last steep hill to Ekshärad church, sure enough, Jens called. I told him I was making that final ascent from the bridge and he appeared at the top of the hill on foot. Loke was being no help up that 8% or 9% grade. I got sneaky and pointed to the top of the hill, “Loke! There’s Jens!” That furry white head whipped around in a desperate search and I repeated. Loke saw him and flung his weight into the harness as his socked paws scrabbled on the asphalt to speed our way to my stocky, red-haired husband. My thighs were screaming as we crested the hill. As I pedaled the last few yards to the car, Loke was hyper and bouncy to see Jens. It took some time, but as Loke got to walk the hubby, I managed to pack the trike away. After I’d taken close up pictures of the church and Jens had shopped dinner at the grocery, he asked me to ride with him to look at a few more places to fish. I agreed as long as it required no walking on my noodle legs. The area he wanted to check was further upstream from Bratt Falls. I agreed, asking if we could take a detour to find that mystery church. We found the road easily enough and the church as well. The sight of it confirmed I’d made the right choice. The steeple top 35 feet high at most and the church the size of a smallish 2 story house. Actually, it had been converted into someone’s house. I’d have been extremely unhappy if I’d come down the hill for that. I don’t even want to use up photo space to show it. The rest of the trip rambled along a series of dirt roads that followed the rapid running stream. It was quite pretty. Jens even found a tiny little cabin for sale. It had a neatly trimmed lawn around with the Swedish style wooden fence and sat barely 150 feet from the rushing water. A wooden home-made sign hung next to the door saying something along the lines of ‘Just Enough’ or ‘About Perfect’ in Dutch. No power and no running water unless you count the stream. I smiled to see it thinking instantly of my dad. I think he’d love a little place like that. A stream to fish from, woods to hunt and forage in. Winters could be difficult though. Hehe. With another jaunt up to another place about 40 miles north to look around, Jens and I returned to the cabin around 7 pm. The ride had been a hard climbing 21.85 miles which had felt like a full day to me though it had ended around 10:47 am. Then lots of car time with the hubby, so it was an incredibly busy day for me. I managed to stay awake just long enough to cook sausages on the stove to eat with a little potato salad and prep some dog socks before falling face first into the bed. The last thought I had was whether or not I’d be able to move for another ride when I woke up. As for my furry cycling companion, he had energy to spare. It even seemed my efforts with the socks paid off! Not a limp to be seen! Longest ride of the year and husky in one piece after it. Accomplishments!